My Cardboard Life » What’s wrong? Apparently it’s actually better to have swine-flu now, in the Summer because by Winter, when absolutely everyone has it, you’ll be immune. So the jokes on YOU Pauline! Having said that, I wouldn’t recommend hosting any swine-flu parties! The idea is to get together with your friends, plus an infected person, and all build up your immunity together. All the newspapers are going on about it, and saying how silly it is. But lets be honest, is anyone actually planning on doing this? Something tells me those newspapers made up the whole idea themselves just so that they could object to it. If you’re suffering for swine-flu, here’s something to cheer you up (I also give you permission to look if you don’t have swine-flu). It’s a guest strip/illustration thing that I did for Unconcious Ink, which is a bi-weekly piece of artwork by Joenis Norac. There’s usually a quite dark and curious theme to the posts. Anyway, here’s my effort. It’s not a completely made up idea. I have heard of stuff like that being done with chicken pox and children, since it’s better to get it when you’re young. Maybe they took that idea and ran with it. 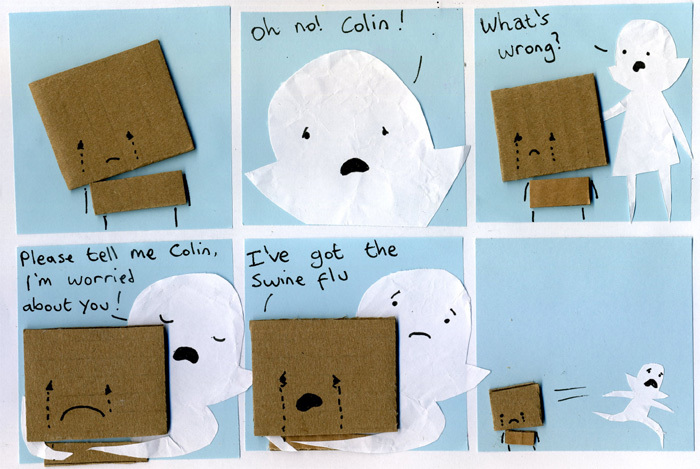 Poor Colin. Shame on you, Pauline! The Queen Pudding thing is pretty creepy and cool all at once. pauline is just like my parents in this comic…. i just got over swine flu! Aaw! I knew she cared about him! GENIUS! i love pauline’s face in the end.